What is the purpose of your event? We believe that it is more than just a good time but an opportunity to make a statement. When you entrust your event planning with us we treat it as a powerful marketing tool for your company to bring a message across to your competitors, potential clientele and employees. You deserve to stand out from the rest and show just how amazing and innovative you really are. Every event has its' own distinct audience, tone, personality and set of objectives. 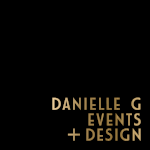 From small meetings to large corporate galas, Danielle G. Events ensures that each event is specifically created to match it's intent. We will collaborate with you to bring your vision to life and do our utmost best to ensure that you are happy with the finished results. Building long-term relationships with our clients is a priority and we promise to keep raising the bar for every event we plan for you.